As we slowly crawl out of the winter, it is time to start looking at some pretty dresses (one of many excuses I use to look at dresses). I have seen SimplyBe mentioned a lot in plus size blogs recently so I thought that I would use the site for my first foray into dresses for the spring and summer. I have shopped there in the past but it has been quite a while now so I was excited to see what they had to offer. I love this dress. It is something that I could use both at work and also at the weekend which is an added bonus. I love the print detail and the fact that the dress actually goes in at the waist, whilst still catering for a larger cup size. I have an ongoing love affair with red. I love this dress because of the added bonus of a pattern, as well as the tie detail at the back to give you more shape. 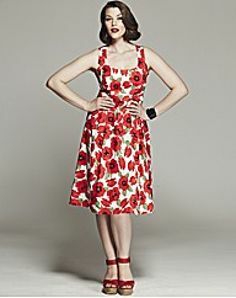 I actually have no idea whether this dress would suit my shape, but I have fallen completely in love with the poppy pattern. 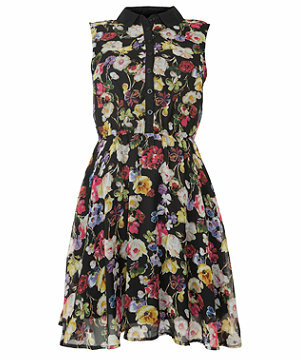 It is bright, colourful and perfect for summer with a 50's twist. Being sleeveless, patterned with a floral print and floaty, this dress is right out of my comfort zone which makes me itch to try it out. I have heard good things about AX Paris dresses although am yet to buy one myself. This dress got a Carrie esq "Helllo lover" out of me when I saw it. I absolutely adore the dress. 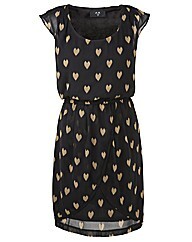 I like that the heart print gives it a feminine touch but the dress has clean cut lines and adaptable to being dressed up or down. So that rounds up my favourite dresses I have seen on SimplyBe. I have to say that I was more than pleasantly surprised with the range, colours and style available for the plus size gal. I think more than one of these dresses will be making their way into my wardrobe.